‘Art’ often has a peculiar way of connecting with us, stirring up our emotions, transforming us and leading us to a state of bliss. Art has the innate power to bring the best within our inner selves. Instantly recognisable for its unique sense of style and form, our newest furniture & accessories brand on-board, Kirigram, which re-defines art in a way never seen before, is no different. 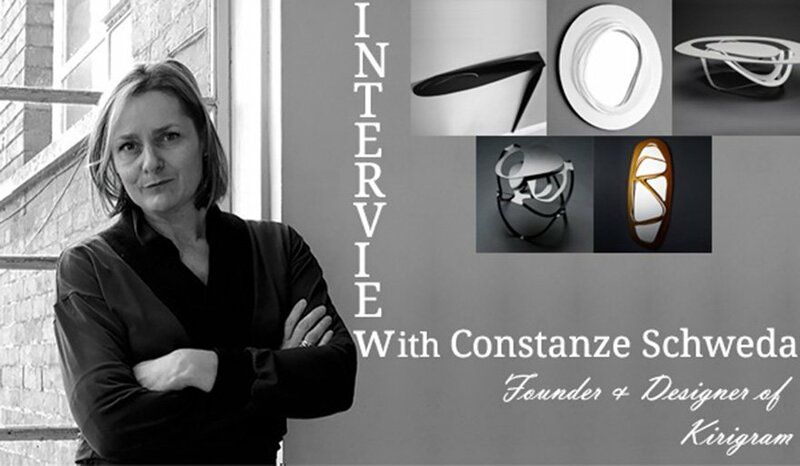 Constanze studied at the Academy of Fine Arts in Munich and graduated as an Interior Architect in 1995. She worked for numerous architecture and design practices before setting up her own office in Berlin in 2000. Since 2005 she lives and works in North London with her partner and their two children. She produces installations and sculptures, designs furniture and works on commissioned architectural and design projects. In 2011 she founded Kirigram. Tell us about how you started. How did Kirigram begin? First came the furniture, then Kirigram. Working on architectural projects, I had the chance to design bespoke furniture. This became more frequent and more popular which led to the idea of designing a whole collection of unique pieces which could be manufactured locally. What has been your inspiration in creating the latest designs of Kirigram? What’s been your favorite piece from collection so far? All Kirigram sculptures draw their inspiration from natural forms. I was always intrigued by the idea of creating seamless shapes from one piece and this became our leitmotif. Our name, Kirigram, is derived from Kirigami, the Japanese paper art whereby paper is cut and folded into a 3D object. My favourite piece is still the Island table which was one of the first models. It’s a great example for our design-principle ‘ the skin forms and carries the structure’. Good design surprises with unexpected answers and avoids false beauty. Where does your passion for design come from? What has been your biggest inspiration or influence on your design career? I am passionate about non-conformism, I like to do things differently. This is very much the essence of design, to keep looking for new ways to improve our life. A new idea is something very fragile and needs a lot of care to thrive. I had the chance to meet the right people to make it happen. But we are only at the beginning. Looking back on 20 years of working as an architect, artist and designer I have been influenced by some great people in my professional life, people with independent minds I met along the way. As an interior architect, what would be your dream project? Many things, designing the revolving restaurant in the London Telekom tower when reopened one day, or a floating theatre, or designing inflatable balconies for skyscrapers. Something unconventional…. My style is sculptural and narrative. When designing a space I don’t apply a particular style to start with. Style is a too restrictive parameter. The architecture should reflect the meaning and context of a space, ideally in the details as well as in the big gesture. When I work, I find music to be too much of a distraction. I like to listen to Phillip Glass, his piece for two pianos. Tell us about a favorite brand or designer whose work you admire and why? Do you have any favorite interior accessory you can’t live without? The first painting I bought, by a friend at the Art Academy. What is the best advise anyone has ever given to you? What are your plans for this year? Should we expect something exciting and new from Kirigram? Hopefully a light will be ready for the next show. How do you see your new partnership with Fabiia take off in the Middle East? I hope it will lead to interesting projects. Looking forward to learning more about this part of the world. This entry was posted in Designer Interview and tagged interview.